Have you cast your eyes on Beady Eye? Yeah, me neither. I was looking forward to getting Liam Gallagher’s new project in my mailbag and it never came. That was over three months ago. 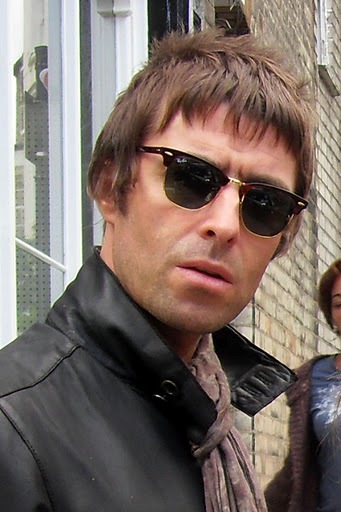 If it weren’t for the fact that Liam was running off his mouth last week about Muse, I wouldn’t have ever thought to mention him and Beady Eye’s new album, Different Gear, Still Speeding. Muse and their singer Matt Bellamy were the latest targets of the former frontman’s tired ploy to draw attention to his lame music by dragging someone else through the mud. "Muse f***ing scares me,” Gallagher told the British version of GQ. “They're like f***ing creepy s***. But people like 'em. They at least play guitars, but when I hear his voice I'm like, 'Ah, f*** him.'" “I see no point/in what you’re thinking/I’m taking you drinking/I’m coming in/you’re coming out/baby hold on,” he brays as the black back-up singers shimmy in their short skirts on the video. Gallagher in my mind has always had a snotty charisma that made him such a great rock frontman, which is why it is such a shame the way he squandered that talent in favor of ripping off the Beatles while in Oasis. Is it safe to assume that he finally broke through his annoying habit of aping the Fab Four? Not so fast. Gallagher takes his obsession a step further by actually referencing the people he’s ripping off in the song “Beatles and Stones.” The song itself sounds like a slice of molten modern rock instead of a Liverpool postcard. “I’m gonna stand the test of time/like Beatles and Stones,” Gallagher shouts, jumping the gun on his lasting legacy once again. Old habits die hard! “The Roller” is a blatant mash-up of Lennon’s “Instant Karma” and McCartney’s “Good Day Sunshine,” while “Wind Up Dream” is a psychedelic rocker that delivers a Merseybeat that swings like the sixties. “Yeah, the Stones were a big one on this record," says Gallagher in the press release. "We were listening to them a lot. We don't go off road and say, ‘Let's make a f***ing Captain Beefheart record. This is what we do." “It’s about time your mind took a holiday/you’re all grown up/ ain’t it time to play?” he sings, drawing a line in the sand and daring his Oasis fans to grow with him. “Standing on the Edge of the Noise” is another slab of acidic feedback that moves Liam further away from the formulaic songwriting of brother Noel’s Oasis. And that, friends, is a good thing. "Music, it's all about the music. We could all have sat at home after Oasis split but what would have been the point of that? We had a couple of weeks off and then we were back in the studio demo-ing. We're musicians, it's what we do, it's how we define ourselves." That's Andy Bell, one of the two guitarists in Beady Eye who left Oasis, explaining why the band had to happen. Second guitarist Gem Archer and drummer Chris Sharrock complete the lineup. The band got top-shelf help from producer Steve Lillywhite on Different Gear, Still Speeding, and they succeeded in creating a loud, exhilarating disc. In fact, the band is most annoying when they imitate Oasis, as they do on the soggy ballad “The Morning Son.” At 6:05, it’s a colossal waste of time. “What happened with Oasis was you'd end up on an 18 month world tour and you wouldn't have any time to put new music out,” says Gallagher. “When you get big, it slows you down. When you start out fresh, it's all about the tunes. And remember, we're a new band, we're not going to get above ourselves and start thinking we can play stadiums and arenas. “We don't want to jump the gun, we want to go out and do small gigs, get back into that vibe then do another album, and take it gradually, stay in the moment of being a new band." There’s some of you out there who will think this is just a holding pattern until Gallagher finally caves into the temptation of cash and rings his brother Noel to reconcile. But let’s face it -- Oasis in its later years became a caricature of itself and probably didn’t deliver much in the way of thrills since “Go Let it Out” more than a decade ago. Trust me on this one. If you can suspend belief for a moment and pretend that you didn’t know Liam Gallagher and Andy Bell from the biggest British band in the last two decades, you probably wouldn’t turn such a jaundiced gaze on Beady Eye. After a few listens, you actually stop “looking back in anger” for an Oasis reunion and start looking forward to what this new band cooks up next. The band flew in and out of North America last week, including a stop at Webster Hall and then it’s onto the summer U.K. festival circuit. Let’s hope they come back soon! Click on www.bedyeyemusic.com for updates.